To complement the time you spend in the gym, the supplements you take, and the healthy diet you maintain, we can help further define your hard work. 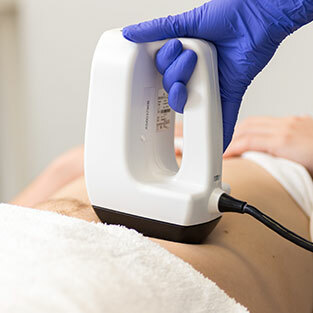 We offer a combination of different clinically proven modalities including radio frequency, deep tissue heating, and suction coupled negative pressure to help reduce your stubborn belly pouch or muffin top. Ageless Living’s BodyFx™ treatment quickly and painlessly contours your body using an advanced thermal energy system to destroy fat cells beneath your skin. The result of this walk-in & walk-out procedure is a reduction in your body’s subcutaneous fat, getting you closer to the coveted six-pack and abs faster than any other non-surgical procedure. Experiencing hair thinning is common as men age, but that doesn’t mean you have to sit back and let it run its course. Hair plugs are expensive and inauthentic, and pills to restore hair can be hit-or-miss, but Platelet-Rich Plasma therapy uses your body’s own natural regenerative abilities to grow real, natural hair with minimal risks. A treatment typically takes less than an hour and is no more painful than having blood drawn. We will take a small amount of your blood then separate the platelet-rich plasma from the other cells. 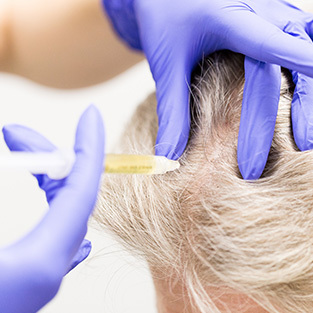 After a full PRP treatment, your hair will begin growing back–it typically takes anywhere from 4 to 6 months to begin seeing results. You get one shot at a first impression; it can be altered by deep lines and wrinkles that look like a topographical map of the Rockies every time you smile, or it can be you. We have skin rejuvenation treatments suitable for wherever you are in your life, whether you’ve just turned thirty and are starting to see the first signs of aging or getting into middle age and looking to get a little of your youth back. These include popular BOTOX® & filler treatments, which can take years off your appearance with incredibly natural looking results and lasts for months to years, and Fractora, which rejuvenates and tightens skin using RF energy. Microdermabrasion or DermaFrac can renew your skin’s natural radiance by exfoliating its top layer, removing dead skin cells to reveal the naturally vibrant, refreshed looking skin underneath. If your skin is marked by acne, hyperpigmentation, fine lines, wrinkles or sun damage Chemical Peels can treat stubborn symptoms quickly and painlessly. Not sure which treatment is right for you? Our Ageless Living Specialists will listen to your concerns and find a course of treatments that are right for you. As you age your skin is going to develop hundreds of tiny (and not so tiny) imperfections. Some of these you’ll be able to live with, others may seriously affect your self-confidence- and from there your quality of life. Our expertise means that we can identify skin problems using the latest imaging technology and can find the right way to treat them with the least invasive methods possible. It might even surprise you to know that most skin tag or mole removal treatments don’t require scalpels or cutting of any kind. When we head out to the lake with our family, or to business meetings with our clients, we don’t want people seeing the hair coming up out the back of our shirts or the rough that’s sitting on the edge of our ears. It’s a fact of life that even as men we still want to look great at any age. Our effective and non-invasive permanent hair reduction services can help you avoid the pain of waxing, or the irritation and razor burn associated with shaving–wherever that might be on your body. Using a combination of sclerotherapy and laser treatments we can reduce the appearance of veins anywhere on your body, especially in the legs, where the treatment can improve visible vessels, swelling, aching, heaviness and discolouration in feet and legs- all without surgery. Plus, we have the ability and specialized equipment to perform ultrasounds of the deep vascular system prior to treatment so that we can create a tailored and appropriate treatment plan. Fungi on your toes and fingernails are uncomfortable and unsightly, and removing it through store-bought treatments is a never ending hit or miss process. Ageless Living uses medical-grade treatments to remove the fungus for good, restoring your nails and toes to their pre-fungal state. Lasers are use to target the nail-bed and destroy the fungi, allowing for new uninfected nail growth. Treatments typically take 30 minutes to treat 5-10 nails and are relatively painless. As a Civil Aviation Medical Examiner (CAME), Dr. Dekker is designated to perform civil aviation medical exams at our Cold Lake location. This comprehensive examination tests every aspect of a private, commercial or military pilot’s health to make sure that you’re healthy enough to operate an aircraft or work as an air-traffic controller. These assessment’s are a required by the Civil Aviation Medicine Branch of Transport Canada. I would like to receive emails from Ageless Living Cold Lake to provide me with professional advice, exclusive discounts, event information and more.